St. Scholastica was born in Italy, and she was the twin sister of St. Benedict of Nursia, the founder of the Benedictine Order. She consecrated her life to God at a very early age. She became a Nun and was the leader of a community of women at Plombariola, about five miles from St. Benedict’s Abbey at Monte Cassino. It is believed that she followed the Rule of St. Benedict. Since she had dedicated herself to God at such an early age, legend tells us that she preceded St. Benedict her twin brother in Godliness, and that he came to holiness after she did. They would visit once a year near his Abbey, and they would spend the day worshiping together and discussing Sacred Scriptures and issues of their time. She went on and founded the women’s branch of the Benedictine Monasticism like her brother’s. Eventually, St. Benedict indicated that it was time for him to leave the area. St. Scholastica protested and begged him to stay with her for the evening so they could continue their discussions. He refused her offer insisting that he needed to return to his cell. St. Scholastica at this point closed her hands in prayer and after a moment, a terrible storm started outside. St. Benedict had asked her what she had done, and she replied, “I asked you and you would not listen, so I asked my God and He did listen”. Benedict was unable to return to his monastery and they spent the night visiting and in discussion. Three days later, from his cell, he saw his sister’s soul leaving the earth and ascending to Heaven in the form of a shining white dove. St. Scholastica died that day, February 10, 547. Her feast day has remained celebrated on February 10th. 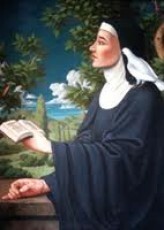 St. Scholastica was the twin sister of St. Benedict. She had dedicated herself to God at a very early age, and was said to precede St. Benedict in holiness. She became a Nun and eventually founded the women’s branch of the Benedictine Rule. There are many Benedictine Sisters around the world today, thanks to St. Scholastica. She and her brother St. Benedict were located about five miles apart, and would visit to worship and discuss Sacred Scriptures. Three days after their last visit, her brother St. Benedict witnessed her soul leaving her body in the form of a white dove. He was located in his cell five miles away, and this happened in a vision.